About 5 feet of something. I used wire this time. Don't know why I think I was too tired to go down stairs and get the ribbon. 1. Take wire or ribbon and bend a loop or if ribbon make a loop. 2. Rows 1 and 2 string two black beads on each row. 3. Row 3 String 2 black then put wires through as if ending the row. But then string the 13 cream beads to complete that row. 4. Bend wire or fold ribbon.But! Then string the 6 creams, 1 orange, 6 creams then 2 blacks and string wire through the other way. 5. 2 black, 5 cream, 1 orange, 1 red, 1 orange, 5 cream. 6. 2 black, 3 cream, 2 orange, 3 red, 2 orange, 3 cream. 7. 2 Black, 2 cream, 9 orange, 2 cream. 8. 2 Black, 13 cream. 9. rows 15. 2 Black. Finish by tying or twisting. 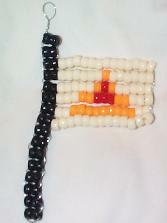 Size E beads are larger than Indian/seed beads but smaller than the plastic mini pony beads. Hamantashen is the special cookie/pastry for Purim. It is traditionally shaped like a triangle. This represents the three corner hat worn by the villian Haman. Because we are imitating a pastry, I have used amber or orange beads but any cake color bead can be used. For the filling on a real Hamantashen we use Jam, Poppy Seeds, and some kids Peanut Butter. So the color of your feeling can be Red, orange, purple for jam. Brown if you want peanut butter color. 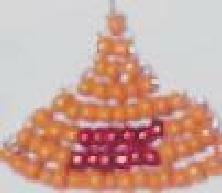 49 opaque orange glass E beads. Twist wire to make loop. 1. Row 1 string 1 orange bead on one wire and bend the other wire to go back through the first bead the oposite way. Continue stringing this way to end. 6. 3 Orange 6 Red 3 Orange. 7. 4 Orange 6 Red 4 Orange. String wire through a second time, so both end up on same side. Twist togther a few times. Bend twist into design to hide. The sparkle of the clear glass E beads really reflected on this picture. I will retake it eventually. This pattern would make a great dangling earring! 1 1/2 feet of wire. Fold wire in half and twist for loop to hang from earring or necklace etc. 1. String 1 Amber Bead on wire. Take other wire end and string back through. Repeat this for other rows. Bend wire back through last row. Twist ends together a few times. Cut wire and fold into design to hide end. This is a little larger still possible for an earring but also great for neck or key chain. 1 1/2 to 2 feet or wire. 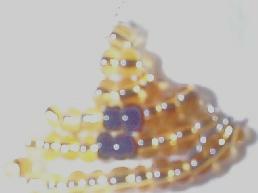 32 Clear Amber Glass E Beads. 4 Opaque Black Glass E beads. Fold wire into half. Twist wire into loop for hanging. 1. String one Amber bead on one end of the wire. String back through with the other end of wire. Repeat for other rows. 4. 3 Amber 2 Black 3 Amber. String wire back through last row. Both wires end up on one side. Twist together a few times. Cut wire and then fold the end into design to hide.